Tag line: ". . . One for All and All for Fun!" 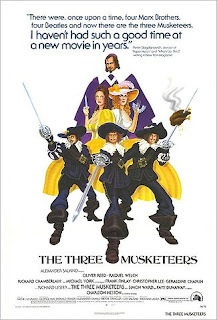 Based on the classic novel by Alexandre Dumas but with a twist of humor added by screenwriter George MacDonald Fraser, 1973’s The Three Musketeers is a star-studded, action-packed adventure that, on occasion, will also make you laugh. It’s the 17th century, and D’Artagnon (Michael York), an ambitious young provincial, is hoping to join the king’s musketeers. Shortly after arriving in Paris, however, he runs afoul of Athos (Oliver Reed), Porthos (Frank Finlay), and Aramis (Richard Chamberlain), all of whom are musketeers themselves. Each challenges the over-confident D’Artagnon to a duel, but instead of fighting one another, the four team up to battle troops loyal to Cardinal Richelieu (Charlton Heston), a religious leader who, with the help of his right-hand man Rochefort (Christopher Lee), is trying to discredit Queen Anne (Geraldine Chaplin). After defeating the Cardinal’s men, Athos, Porthos, and Aramis help D’Artagnon settle in, giving him money to hire a servant (Roy Kinnear) and find lodgings for the night. As it turns out, the landlord who runs the boarding house where D’Artagnon stays, an elderly man named Bonacieux (Spike Milligan), is married to Constance (Raquel Welch), a woman half his age who is also the Queen’s dressmaker. After discovering that Richelieu intends to tell the King (Jean-Pierre Cassel) about Queen Anne’s dalliance with the British Ambassador, the Duke of Buckingham (Simon Ward), Constance asks D’Artagnon to help quell the situation. Aided by his new pals the Three Musketeers, D’Artagnon does what he can to protect the Queen’s reputation, but are Richelieu and his accomplices, which includes the lady de Winter (Faye Dunaway), more formidable than the young man initially realized? The most impressive thing about The Three Musketeers is its cast, starting with the musketeers themselves. From Oliver Reed’s brooding, no-nonsense Athos to the flamboyance of Finlay’s dapper Porthos; and from the quiet, sometimes pious ladies’ man Aramis to the eager newcomer D’Artagnon, each has his own distinct personality, making them all the more interesting as the story progresses. In addition, Raquel Welch delivers one of the finest performances of her career as the clumsy but beautiful Charlotte (the role won her a Golden Globe for Best Actress in a Comedy or Musical), and Geraldine Chaplin is effective as the dutiful Queen who has fallen in love with another man. Toss in Roy Kinnear and Spike Mulligan, both of whom generate a fair number of laughs, and you have one hell of a collection of stars. Most fascinating of all, however, are the film’s villains: far from the evil, moustache-twirling baddies you find in other movies, Heston’s Cardinal Richelieu and Lee’s Rochefort are laid back, approaching things with a cold detachment that makes them seem even more sinister. Equally as strong are the sword-fighting sequences. Unlike the rest of the movie, which is comedic in nature, these battles are fairly intense, and have an air of genuine danger about them (several performers were actually wounded, including Oliver Reed, who almost died when he was stabbed in the throat during the windmill sequence). Choreographed by William Hobbs (who also worked on such films as Flash Gordon, Excalibur, and Rob Roy), these fights are guaranteed to drag you to the edge of your seat. 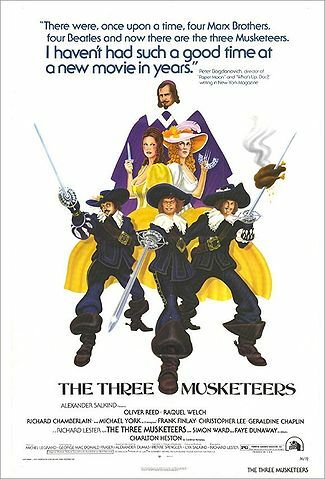 Originally intended as a three hours plus epic, The Three Musketeers was instead split in two, with the second half of the story released a year later (as The Four Musketeers). I have yet to see this sequel, but after spending time with these well-realized characters, I admit I’m looking forward to it.